Notice the stylesheet link in the <head> section: <link href="../Styles/RodsFormat.css" rel="stylesheet" type="css" />. See my post on how to create and link the stylesheet for more information. 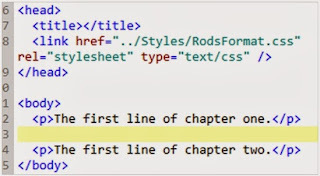 This is required in EVERY chapter to allow the e-reader software to find the style information to format the text. You need to be in code view to be absolutely sure of the position of the cursor relative to the html tags. 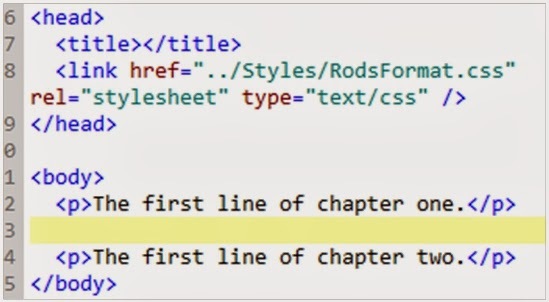 An important detail to note is that Sigil reproduces the stylesheet link used in the original chapter in the <head> of the new chapter, as shown above. 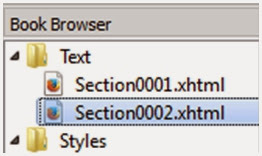 Section0001.xhtml now only contains whatever was above the cursor. Section0002.xhtml contains everything which was below the cursor. I recommend renaming the chapters with informative names as you go along. (Right-click on the chapter name in the book browser to do this.) Remember to use chapter filenames which are single text strings with NO SPACES. Click and drag the chapters in the book browser to resequence them. Sigil will have created appropriate entries in the <manifest> and <spine> in content.opf for you. With a long book, splitting the first chapter will take a while but as you get nearer the end of the text each successive chapter will take progressively less time to split. If you place the cursor at the START of a chapter, splitting the chapter results in a new BLANK chapter BEFORE the chapter you split. Pacing the cursor at the END of a chapter results in a new BLANK chapter AFTER the chapter you split. Carry on until the whole book has been split up into chapters. Next steps: Create the preliminary matter (title page, copyright page, etc.). The next post in this series will cover the customary sequence of the preliminary matter and end matter. the large volume conversion shops, we are not satisfied until you are Epub3 conversion. You can also hire Brian Schwartz, the Kindle Expert for one-on-consulting through Amazon has the highest consumer trust of any company on the web. It would be great if epub 3.0 were available on more e-readers!!! THIS sequence of posts is about making an epub 2.0 e-book which will convert properly to Kindle, and display similarly on both platforms. In fact, as by far the vast majority of our sales are via the Kindlestore, the kindle is more important to me than the e-pub, which is just a means to an end. It IS a conservative strategy, but at least I can be confident all my e-books work on all readers. I use a bare minimum of html and CSS in an attempt to reduce any possible cross-platform issues. Sometimes, less is more?